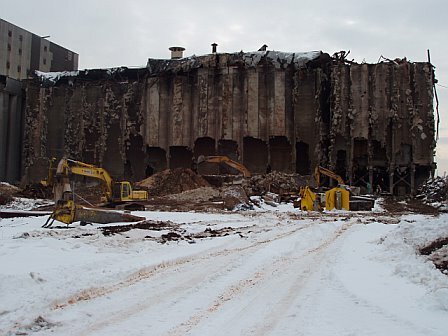 This project consisted of the demolition of 271 grain silos, 130 feet tall and a head house that stood 215 feet tall, which was located in the middle of the silo complex. Some of the silos, and another head house were located directly adjacent to the Calumet Channel, just a few feet away. Omega was contracted to remove the silos, head houses and underground concrete foundations, to clear the site for future use. All concrete was crushed on-site, producing a granular material for backfill and site grading. Omega worked very carefully, to ensure that concrete debris would not fall into the river, or damage surrounding operating structures. Omega completed the project on schedule, which allowed the Owner to proceed with redevelopment plans.